Your gift is the “foundation” for all we can do. Make a one-time or recurring donation. Payment information will be securely processed by our nonprofit partner, Network for Good. Please make your gift today. 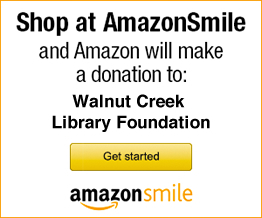 Please make checks payable to: Walnut Creek Library Foundation or WCLF. Many employers offer matching gifts programs, which can double or even triple employees’ charitable donations. Please contact your Human Resources Office to see if your company will help double your impact. Consider donating appreciated stock, which will often create tax benefits for donors. Please call Executive Director Susan Moon at the Walnut Creek Library Foundation at 925.935.5395 for instructions on how to transfers gifts of stock to the Walnut Creek Library Foundation. Leave a lasting legacy to the Walnut Creek Library Foundation by remembering us in your estate plans. You do not have to rewrite your current documents. You can simply add an amendment to your will or living trust. To leave the Walnut Creek Library Foundation in your will, click here for suggested bequest language. Donors who include the Walnut Creek Library Foundation in their estate plans are honored through the Foundation’s Heritage Circle, a recognition group that honors and thanks donors for their support of Walnut Creek Libraries. Donate car, truck, motorcycle, RV or Boat! It’s faster and easier, tax deductible and costs you nothing. Call 925.229.5444 or fill out our on-line application here.